An Officer and a Spy, a dark, detailed, and devastatingly moving historical novel by Robert Harris, is an absolute success. I know because I stayed up reading it until ungodly hours of the morning on two successive nights—when I legitimately could not afford the lack of sleep. I didn’t care. This novel had me in its thrall from the first page to the last. 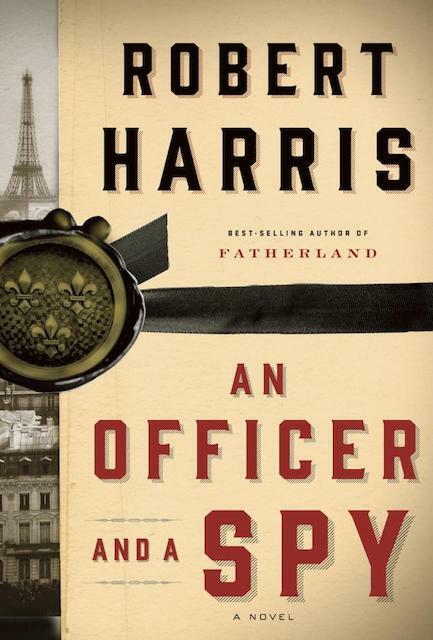 Harris tells the story of the Dreyfus Affair, one of the most polarizing and shameful episodes in French history. (Don’t have the particulars of turn-of-20th-century France at your mental fingertips? I recommend a quick internet search to refresh your memory before beginning, as Harris populates his novel entirely with real-life figures of the time.) The plot follows Georges Picquard, the youngest colonel in the French military and head of French intelligence, as he acts as witness to and unwitting accomplice in the railroading of Alfred Dreyfus, a young Jewish officer accused and convicted, repeatedly, of spying for Germany. Dreyfus’ downfall and disgrace, based on glaringly trumped-up charges, were matters of carefully manipulated public spectacle. He was convicted in a secret trial with manufactured evidence and eventually sentenced to solitary confinement on Devil’s Island off the coast of French Guiana. Behind it all, of course, is the oppressive yet casual anti-Semitism that pervades French society at the end of the 19th century, informing all social interactions, perverting the military’s code of ethics and honor, and acting as impetus and backdrop to Dreyfus’ fall. In Picquard’s gradual awakening to his beloved military’s dirty dealing in l’affaire Dreyfus, he must question his own prejudices, loyalties and betrayals, and eventually he must face the loss of cherished beliefs in his search for the truth. Harris tells Dreyfus and Picquard’s story with insight, extreme attention to detail and a profound understanding of the ethical issues that obsessed France in the wake of the Dreyfus scandal—issues that, with minor tweaks, we grapple with today. It’s a novel well worth several sleepless nights.